A common plant of mortared stone or brick walls, introduced from southern Europe. The flowers are like miniature snapdragons (compare antirrhinum), usually pale blue with yellow 'bosses'at the entrance to the throat; occasionally white. Flowers are produced abundantly from spring to autumn, and often through the winter in mild places. 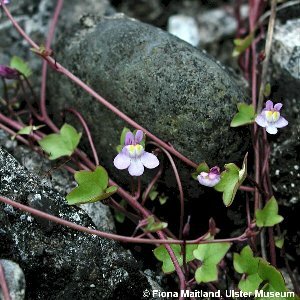 All names: Cymbalaria muralis P.Gaertner, Meyer & Scherb. ; Linaria cymbalaria (L.) Mill.